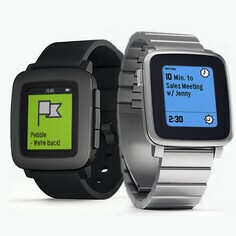 New software development tools being released today to third-party app developers, will allow voice dictation to be used with apps for the Pebble Time and Pebble Time Steel smartwatches. The same capability will be offered to developers for the upcoming Time Round, on November 8th. The dictation API is based on Nuance's voice recognition technology, and will work seamlessly with third party apps running on both the iOS and Android version of the watches. The press release issued by Nuance also mentions that Pebble Time and Pebble Time Steel users with the Android version of the watches, can now dictate replies to emails and texts by using Nuance voice recognition. The same feature will be available to Android powered Pebble Time Round users starting on November 8th. "The value of a smartwatch is directly connected to its overall aesthetics, fit, and intuitive functionality. Pebble is committed to offering not only a variety of smartwatches that blend into individual lifestyles, but also to expanding the usability of Pebble smartwatches world-wide through frequent software upgrades. Making voice capabilities accessible to developers will help grow the Pebble app ecosystem exponentially, providing Pebble users access to more apps that are fun, intuitive, and easy to use. "-Kean Wong, Vice President of Software Engineering, Pebble. While some voice features are already supported by the new Pebble Time watches, it is nothing like the possibilities that have opened up with the introduction of today's new tools. While being able to dictate text and email responses sounds quite useful, after that it will be up to developers to see how they use voice recognition on their apps.